What a hullabaloo – horse meat in the burgers no less. But why are people buying frozen burgers of questionable origin when it couldn’t be simpler to make your own from lovely Irish beef. Buy your meat from a good butchers or even the supermarket, there are not many horses trotting through either. You can buy premium steak mince but the cheaper stuff is also nice and the extra fat keeps it lovely and juicy. But the real secret to a really, really great burger is a splash of fish sauce. You know the stuff, smells disgusting and fetid, it is made from elderly anchovies after all, but its pure umami brings out the savory depth in foods and will make the best burger you will ever taste. So here’s what to do. 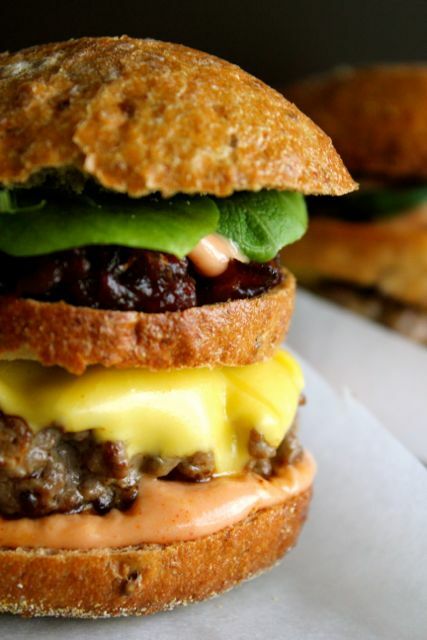 In a bowl, combine all burger ingredients together, smushing the beef with your hands. Leave to sit for 20 minutes. Shape into a balls and then flatten into burger patties. While the burger mix is resting, caramelize your onions by slicing them very finely and then cooking them in 3 tbsp of the olive oil over a low heat in a heavy based, non-stick pan. The onions take around 15-20 minutes to caramelize properly but it’s worth it. Cook until golden, sticky and just starting to get a little crispy and then add a pinch of salt. In between watching the onions, mix together the ingredients for the sauce, adding the hot sauce at the end cautiously and tasting after every drop or two until your preferred level of ‘zing’ is reached. Put the bread into the oven to warm while you cook the meat patties in a non-stick pan with a little olive oil over high heat, for a couple of minutes each side. Don’t fry them slowly or they will get tough and loose all their juicy-ness. Pile on the lettuce, gherkin and fresh tomato, add the hot beef patty and top with the cheese so that it melts deliciously on top. Use your favorite cheese but I like processed sliced cheese for a proper melty cheese burger experience. Feel free to mix it up with any other condiments of your choice, I like a few jalapenos sometimes or maybe some beetroot if you are a lovely Australian. Then the caramelized onions and pink burger sauce. Pure beefy perfection. And there you have it. 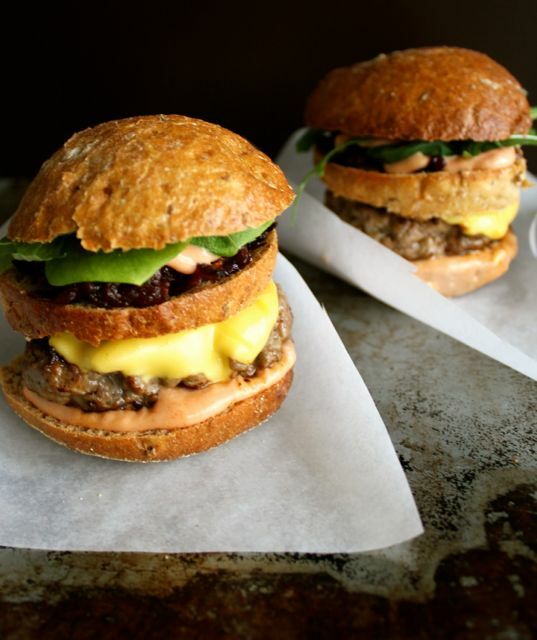 Delicious, juicy, healthy burgers, without a trace of ‘my Lidl pony’ in sight. This made me giggle! I am from the uk but live in Canada now and have been watching the news with all this horsing around! I am also a butcher so know the importance of not buying the cheap stuff! It’s cheap for a reason! Oh and the burger looks great! Hi Elyse – I know what you mean. I’m lucky that I know to the exact field where my beef or lamb comes, from the name of which local farmer is on the white bord in the butchers. Good tracable chicken is easy to source nowadays. Lots of work still to be done for the poor piggies in Ireland though. Thanks for stopping in. Those look like some seriously good burgers. And seriously, who was even buying those awful Tesco burgers anyway? People need to think more about where their meat comes from and I’m sure a lot of what Tesco put in their meat products is much more disgusting than horse! I am with you on this. Fish sauce is one thing I couldn’t live without. I make a lovely chicken marinade that has nothing more than fish sauce, garlic & sugar in it. It is amazing as would these burgers be. Hopefully more people will be making their own from now on! Hmm, fish sauce. Interesting. I’ll have to try it! But with ground turkey, instead. Thanks for the secret sauce recipe I don’t like mayo so I’ll use non-fat Greek yogurt, instead. And everyone, please splurge on organic ketchup — HUGE difference! These look so yummy. This made the news here in NYC too! Never thought about fish sauce to make my burgers, definitely doing it next time. Lovely to find your site. Some people have little choice what to buy due to the dire economic straights a lot of people find themselves in these days. Sad but true. I hope so too, Laura. The organic ketchup is worth the splurge, i do agree. …and lovely to meet you too on twitter, Dervla.